It's sad to think that there may be an end to LCD Soundsystem's exceptional dance-punk style on horizon. I have a special attachment to Sound of Silver, mostly cultivated through extensive listening at work that planted a seed, finally blossoming into an unfaltering love. LCD Soundsystem excels at blending digital, multi-track music with words that are so real and readily applicable to life. Songs like "All My Friends" and "New York, I Love You but You're Bringing Me Down" have a sort of eternal resonance that makes them not only interesting to listen to, but also builds a sort of kinship. We've all been in the mental/emotional places that these songs highlight. Distance, sadness, confusion, incompleteness, and nostalgia comprise a large portion of life. The whole exercise of growing up is predicated upon failure, retries, ego-boosts and ego-breaks. And we'd all be so lucky to have our individual experiences soundtracked by such dynamic, motivating music. 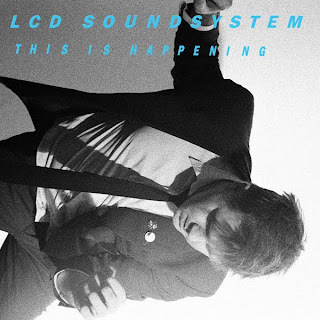 LCD Soundsystem's newest This Is Happening will release here in the States on May 18th, but at present it is streaming for free via the band's website at lcdsoundsystem.com/thisishappening/. I have listened through the album twice, and I can't imagine a better way for the band to cap off this project (if this is, in fact, their final collaboration). James Murphy has always had a grasp of those qualities that make up great music. While the music LCD Soundsystem has shown some signs of repetition, the mood, style and tone of each song has been carefully honed. This Is Happening starts with a slow burner, "Dance Yrslf Clean," which plays up a certain level of drama in the whispered, paced lyrics that builds up and finally overflows in an explosion of dance beats and raucousness. Really, it's the perfect "welcome back" track because it doesn't force its way into your ear so much as (like a great salesman) endear itself to you before showing its true colors. If you know LCD Soundsystem at all, you will instantly recognize this track, like a mother knowing its baby's cry. The powerful opener fades down into "Drunk Girls," a track that is chanting and anthemic. And then "One Touch," which calls interaction and connection as its primary topics. Really, there's not a bad song on the album. The confessional, intimate style (something rare for dance music) permeates this album, as it does other LCD Soundsystem albums, but here even more so. "All I Want," "I Can Change," "You Wanted A Hit," and "Pow Pow" all fulfill the upbeat requirements, creating an air of happy dance-pop that drives the core of the album. But, it's the closers that really pluck at the heartstrings. "Somebody's Calling Me" is a quiet, austere track that settles the mood for "Home." "Home" is the last song on the album. It's all about leaving something and moving on, and reconciling that change. In a lyrical gem we're given: "You might forget the sound of a voice/Still you should not forget the things we laughed about." It seems that we're always confronting this idea, moving on, leaving, changing relationships. Life is transition, or rather, living is transition. When we're stationary (in mind, heart, body, or any combination) is when we begin to die. Sometimes, as in this closing track "home" is actually just transition, rather than some arbitrary stationary object. Ultimately, "home" lies in love and memories; it's always there, but the way we perceive it always changes too. So, LCD Soundsystem leaves us with some philosophical thoughts, as they've done before. If this album is a goodbye, a parting gift, then it's a truly sincere one. And if LCD Soundsystem returns for a fourth helping, then it's just an incredibly apt closing to the album. Pick up a real copy on May 18th, and listen through the catalog because every song in the LCD Soundsystem project is precise, caring and exceptional.